Injured In A Texting and Driving Accident? According to the National Highway Traffic Safety Administration (NHTSA), distracted driving caused 10% of fatal car accidents in 2015. As of July 2018, texting while driving is banned in 46 states, Puerto Rico, Guam and the District of Columbia. Yet 45% of 2017 Traffic Safety Culture Index survey respondents admitted reading texts/emails while driving during the last 30 days. That's why it's critical to have a professional lawyer helping you get the justice and financial compensation the you deserve. Cell phone use increases your odds for getting into a car crash by 83%, according to the 2018 AAA Foundation for Traffic Safety study. 84% of 2017 TSCI survey respondents saw other drivers texting or emailing on phones within the past 30 days. 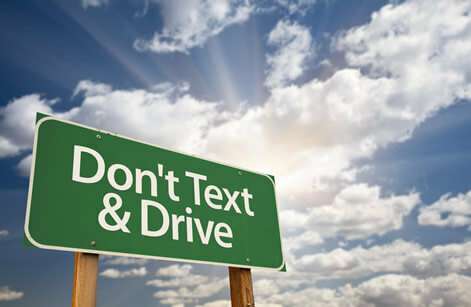 96% say texting or emailing while driving is unacceptable, despite 1 in 3 drivers doing so within the last month. 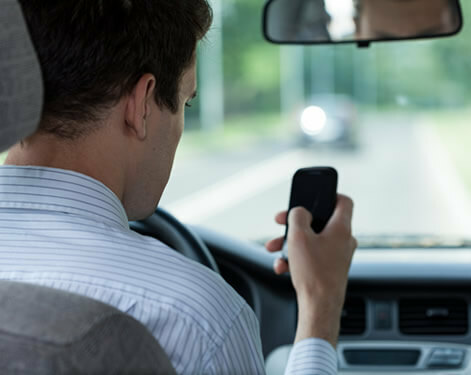 15% of car crash injuries in 2015 involved distracted drivers; 21,000 drivers were using their phones when the accident occurred. These distracted driving statistics are alarming and leave many innocent motorists injured due to another driver's negligence. Speak to an attorney with no obligation. It's simple. If you don't win, you don't pay. Don't make the mistake of going it alone. Recovering from an auto accident is not only stressful, but it also often carries a heavy financial burden. It's important to hold reckless drivers responsible for damages and ensure you are rewarded properly for medical expenses, property damage and lost wages. Our free case review service is ready to connect you to an attorney who best fits your needs and will fight to maximize the amount of compensation you receive. Why Use First Injury Help? If you were hurt in an auto accident, it's likely you have many questions such as: Who will handle my medical bills and replacement transportation? How can I cover my lost income from being unable to work? We can help you answer these questions. Never an obligation to involve the lawyer you speak to; you decide if you want to proceed. How long do I have to file? The law limits the amount of time you can file a claim and collect damages for your auto accident. That law is called the Statute of Limitations. No matter how great your loss, you will not be able to collect if you miss this deadline. Your lawyer will know all the deadlines for your state. Putting a claim together can take time, so it's important to consult with a lawyer near you as soon as possible. To have a case, you must prove that: 1. Legal duty existed, 2. The defendant(s) failed to exercise that legal duty, 3. The plantiff(s) were injured directly or indirectly because of that breach of duty, and 4. There were damages (money lost) that can be recovered from the defendant. Liability is when someone is legally responsible to another person because of his or her actions or failure to act. In a personal injury case there may be several parties who have a certain degree of liability or responsibility for the auto accident. Negligence is when one party is careless in its duty to someone. For example, if a landlord doesn't repair a broken step and someone slips and falls, then the landlord was negligent. He had a duty to fix the step; he didn't fix it; someone fell and suffered damages because he didn't fix it. Negligence is often part of personal injury cases. What can be considered Damages? Damages is the legal word for the money an injured party has lost due to an injury. Those damages could be medical bills, prescriptions, time off from work, lengthy recovery time, and also pain and suffering. Most insurance policies only cover certain parts of the cost involved in common injuries like car accidents, slip and falls or workplace illnesses. For example, they may pay the hospital, but not rehabilitation specialists. Personal injury lawyers make it their job to recover damages from all responsible parties and cover more than just medical bills, but also things like pain and suffering, emotional distress and time lost from work. Find out if you qualify for a claim! First Injury Help is a Nationwide service that provides FREE attorney consultations to injury victims. Disclaimer: This is an advertisement, not a lawyer referral service. We are a privately owned, nationwide, group-advertising service. We are not a law firm, and for that reason do not prescreen or evaluate your requirements or claim. We provide your information directly to a sponsoring lawyer in your geographic area so that they may provide you professional legal help. Our network of lawyers may be able to provide you with options, advice and counsel regarding the specific requirements of each state and your claim. The information contained in this website contains general information only and does not constitute legal advice. Please consult with one of our sponsoring lawyers to obtain an assessment of your particular situation. No lawyer client relationship is formed expressly or by implication by your using, accessing or entering information on our website.